$180 billion (in 2013 US$), equivalent to 0.40% of developed country GNI remains to be delivered in order to meet the UN target of 0.7% of GNI devoted to ODA by 2015. A breakthrough in trade negotiations was achieved in late 2013. The Bali Package included agreements on trade facilitiation, agriculture, a package of decisions for the LDCs and a monitoring system on special and differential treatment provisions. However, the Doha Round of multilateral trade negotiations that delivers real and substantial benefits to developing countries, including duty-free market access, tariff reductions and elimination of agricultural subsidies, still remains to be concluded. No international sovereign debt workout mechanism has been created, thus the debt problems of developing countries are not being dealt with comprehensively. Availability of essential medicines in developing countries remains low and prices are high. Essential medicines are available in only 55% of public sector facilities. The cost of ICTs in many developing countries remains prohibitive. 68 out of 100 inhabitants in developing countries do not have access to the Internet. 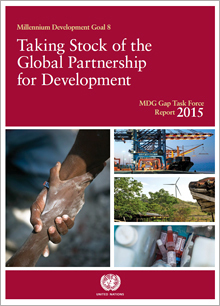 The 2015 Report of the MDG Gap Task Force was launched today in New York by Secretary-General Ban Ki-moon, Under-Secretary-General for Economic and Social Affairs Wu Hongbo and UNDP Administrator Helen Clark. The Third International Conference on SIDS was convened in Apia, Samoa, from 1-4 September, 2014. The theme of the conference was: The sustainable Development of SIDS through Genuine and Durable Partnerships. The United Nations General Assembly adopted a resolution on principles to guide sovereign debt restructuring processes. Ambitious new agenda would end poverty by 2030 and universally promote shared economic prosperity, social development and environmental protection.